One of the most fun groups of people I know are the fellow members of the Grand River Bead Society (GRBS). It's where we get to share our knowledge and inspire others. It's also where we can freely talk ad nauseum about jewelry making! We meet once a month for 10 months of the year. 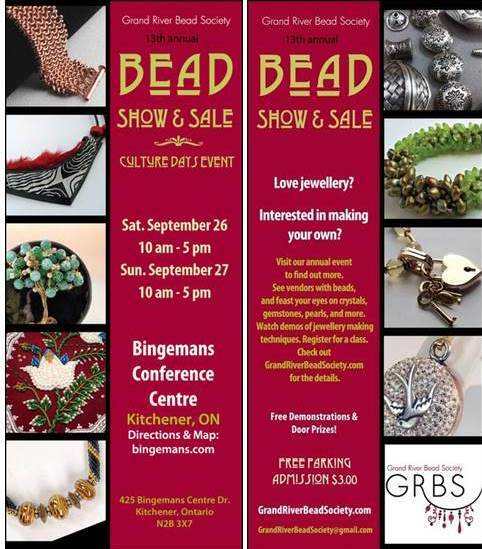 We also have our own Bead Fair coming up this weekend! So if you are close enough - and I know some of you are - please drop by. Maybe I'll bump into you? There are 20 exhibitors there to help you with your addiction jewelry making passion. There are also several classes offered by some of the members - I believe there is still space. As it coincides with Ontario's Culture Days, we also have free jewelry making activities scheduled on both days. So bring friends and family for a fun outing. The organization and work put into this fair by all the volunteers has been tremendous. GRBS is a non-profit group. The Bead Fair helps us raise money so we can continue our mission to educate and inspire. The funds raised pays for our meeting space and subsidizes all sorts of classes and activities for the members. Our 2015-2016 season started off with a big bang last Monday with a metal etching class led by Caroline Andrews (Sunline Metalz). It was a lot of fun! As you can see from some of the pictures posted on our Facebook group, the class was well organized with preparation and etching stations for the 30 of us! That's me in the white sweater (not the most brilliant choice of attire for a potentially messy activity!) leaning over to choose a PNP printout. PNP is Press-n-Peel blue transfer paper originally used for circuit board etching. We each had a kit which included two copper pieces. These had to be sanded smooth and cleaned so there were no oils from fingers on them. I tried two of the design methods. I used a thick oil based blue ink pen to draw some squiggles on a metal ring (below left). PNP designs had to be rubbed with the metal on a hot plate. The design on the right is someone else's PNP design. One of the great things about classes like this is we learn various tips. The metal pieces were actually stuck onto duct tape sticky side up. The duct tape in turn held polystyrene blocks which allowed the pieces to float face down on the ferric chloride (etchant). Once the pieces had been etched, it was time to sand off the oil based ink. 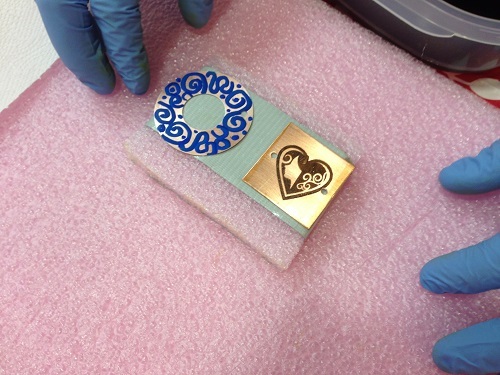 The ink protected the copper from the etchant. The grey areas are now slightly lower than the copper areas. We also had a choice of patination solutions. These are by Jax. The one on the right works like liver of sulfur but has no odor. (Another alternative which might be easier to get hold of is Gun Blue - see this past post). 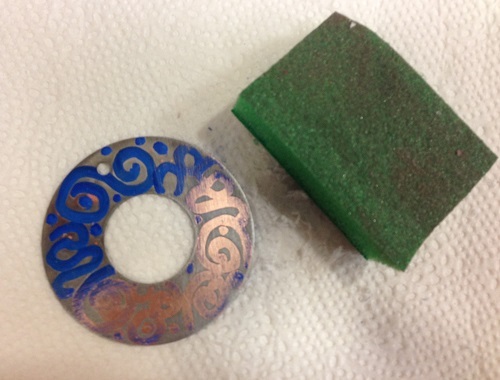 I used a delicate PNP design on my square copper piece and the other oxidizer. I wasn't as successful with this one as it was hard to remove the details with the emery paper without taking off the patination. But the colors are intriguing! One reader emailed me some time ago to ask if I knew of a bead society near her. One quick Google search later, and it appears there was. So check out if you have a bead society near you! That would be so much fun! I need to find some pencil like emery paper for small areas. I really enjoy etching!! I've used Stazon and stamps for my designs and had wonderful success. It's easy to do if you have a good clean piece to etch on and Hello! what a wonderful product ferric chloride is!! The only problem is that it is easy to slop around and stains immediately! I gave a small shriek when I saw your white sweater - especially knowing what I've done to some of my clothes (and floor and counter). I usually do my etching outside on a nice warm sunny day and that seems to promote the etching. I've also read of people putting it on top of their dryer for the warmth and the gentle agitation that occurs. 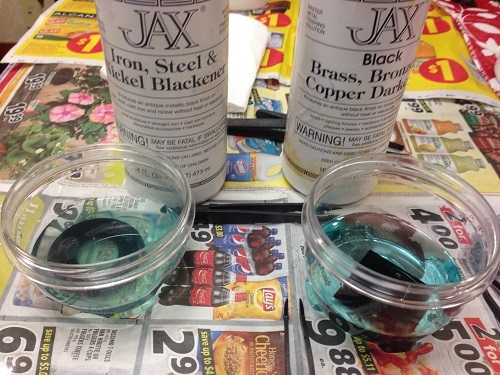 I know some people will have a fit over the ferric chloride and want to know about greener solutions for etching. There certainly are plenty out there available with a quick search. I've also reused my pieces of Styrofoam over and over - why not? A quick wash with dishsoap and they're good to go once more. Finding those thinner sheets of foam is not always easy but I save mine from any packing that comes into the house. Did I send you a pic of a cuff I did where I coloured the etching with Swellagant afterwards? I was very happy with it. The one thing I've learned is that with a deep etch your sheet metal becomes thinner - something to keep in mind if you want to create cuffs etc. I noted that after 2 uses and pushing the third that I needed to add to the time I left the metal in the solution. And then there's the disposal of the used ferric chloride. 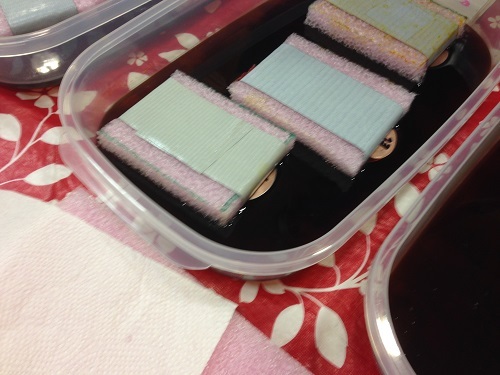 Adding baking soda slowly will neutralize it. Some people say to pour it down the drain but I'm not happy with that. I pour my used up solution into a glass jar with a tight lid and take it to our local fire department when they have hazardous waste cleanup. I mark my jar with what the contents are so that they can then properly deal with it. That way I know I'm not adding it to our waste water problem or even worse - pouring it onto the ground.....eeek!! Love your tips! And yes, do send that picture of the cuff you made. Yikes! No one should be pouring ferric chloride down the drain - think about the pipes!! BTW. My white sweater survived! Must be the years spent in the lab being careful! Oh - that made me laugh!! Practice must have helped to keep it clean!! Hi Alicia, I know of the show but alas I cannot make it this year. I hope to get there at some point!